This is a guy who had me on his bandwagon when Dirk went down. He has some ability and the Mavs just are not that deep. 21 points and 5 rebounds while shooting 6-12 from the field and 9-12 from the line is respectable. He is the first guy off the bench for this team, at least until Dirk gets back, so look for him early and look for him often. I loved this guy when Yao first got hurt. Then I hated him. Now I like him again, as he is becoming more involved in the offense. Not too much of a line, just 24 points and 7 rebounds (nothing else, literally). He shot a respectable 7-12 from the floor (I only say respectable since he is a big man) and 10-12 from the line. 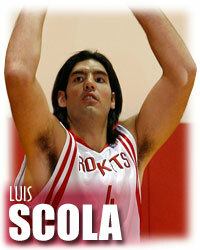 T-Mac has been giving signs he’ll probably choke again in the playoffs, so we should see Scola’s role increasing in the final few weeks of the season. Stephen Curry might end up being a smaller version of Kevin Martin in time.